Well, I had a small break before going into hospital for a skin graft that will see me out of action (in the train room) for all of July. Hopefully I will be out of action in August as well as I plan to be at the NMRA convention in Kansas City, and then spend time with my son and family in New Jersey. So I got stuck into the new mainline and the lift up bridge to test all the research I had done. So here are some photos of progress and some lessons learnt building the lift up bridge. Plus my experience laying tracks. I proceeded to lay track from the current mainline at the far end of the layout. 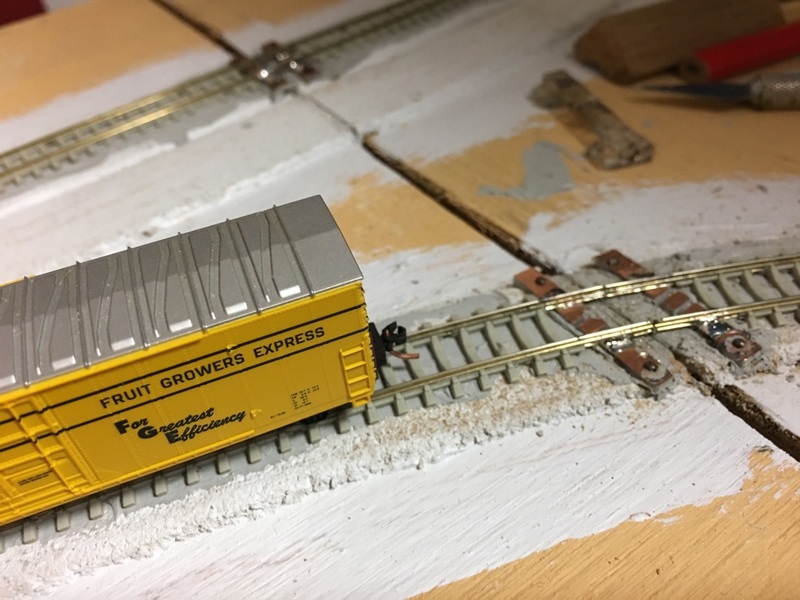 The yard switch ladder was wired for DCC at the bench and joined as one unit (5 switches) by soldering the metal joiners. 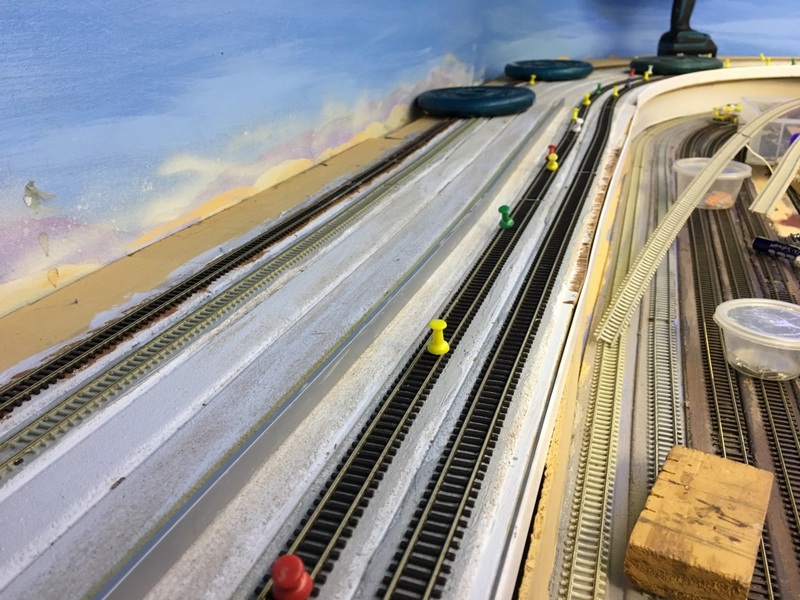 All the frogs and stock rails are wired. Some will go to "HexJuicers" (automatic polarity reversers from Tam Valley) and some will go to DPDT ground switches where there is room for them. The DPDT switches will be the switch stands and levers. The track is held down with grey caulk, spread evenly with a putty knife. New yard entrance and mainline. 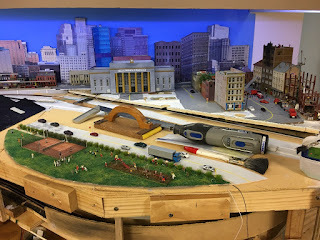 Here is another view of the yard and mainline being glued down. I have a 2M long by 9mm wide heavy aluminium bar that I can lay inside the straight track to ensure it is glued down straight. Once happy - and an eye test along the rail is worth doing as well, I use a narrow roller to press down the track. Often this is sufficient but sometimes pins and weights help to ensure nothing moves. 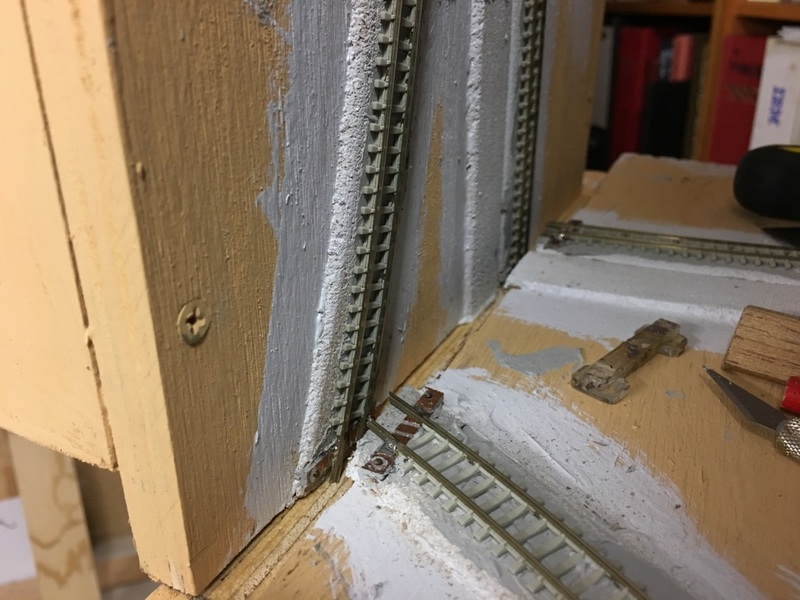 In order to get the 7 tracks through the north west corner I had to cantilever the base over the yards below by about 100mm at the widest part. This cantilever is only 3mm plywood but due to the base plywood it is glued to, plus the 20x20mm angle as shown around the edge it is very stable. Here is the return loop entering the branch line. 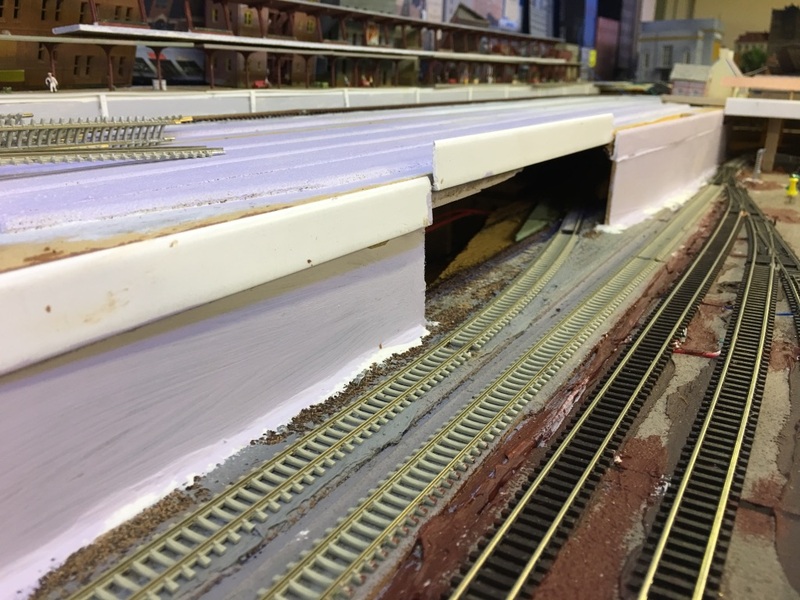 I continued the 20x20mm plastic angle around the edge of the entire new section. To hide the wiring and under track "spaghetti" I used 3mm MDF as a "concrete wall". This was about 50mm wide (high). I held it in place with clamps where necessary and used "no more gaps" filler to hold and seal it in place and seal any gaps between the wall and baseboard. Then I primed the MDF with cheap paint, and eventually it will be a "concrete" wall when I decide whether to use commercial sheets or scratch build the "wall". A small section of the previous city was able to be saved and is roughly in place to see whether the layout works. 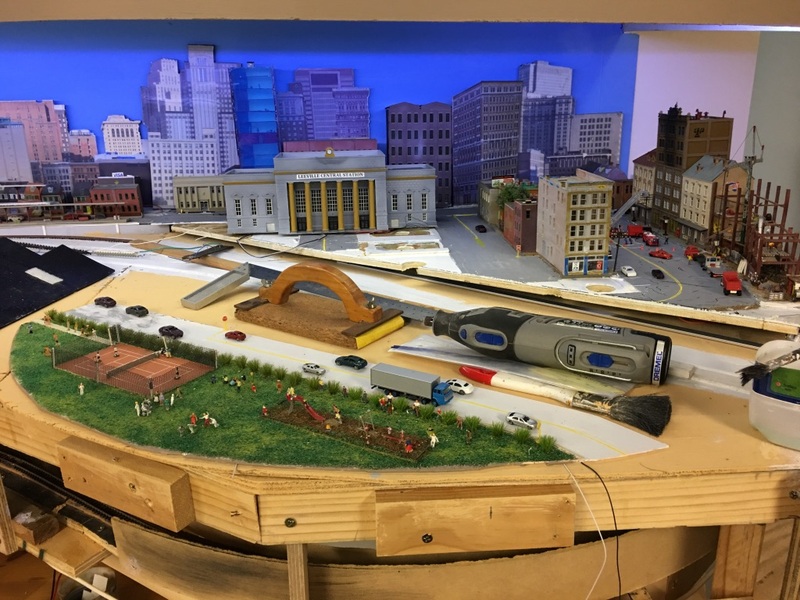 The city park definitely works and I think I will need an road bridge from the city across the tracks near where the Dremel is in this photo. Hold the track down with extra caulk and use super glue as well. I watched videos on a top quality swing bridge where the builder did this, but still wanted more stability. Use "set track" on each side of the bridge. This may work but not where the tracks are not straight. Also the track would look different to the Peco code 55 concrete sleepers that I use on my mainline. Set track certainly doesn't bend like flex track. 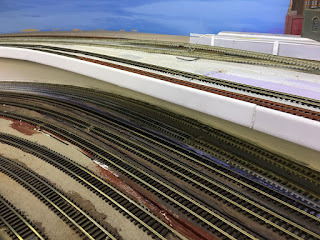 Have a removable section of track. This works for modular layouts but would be too much effort every time you wanted to raise the bridge. Insert screws under each track on either side of the gap and solder to the rails. This is a good idea and one I almost used. Drill holes in the sleepers near the joint for spikes to provide extra anchoring. Yes, maybe. Replace the last sleeper (tie) before the joint on either side with a copper tie. Then solder the rails to the copper tie after insulating the tie. This is the method I chose and here are the photos to show the result so far. The copper ties are copper plated board available from all electronics shops. Here is the first track laid across the gap with the copper ties in place. Note I drilled small holes on each end of the ties so I could insert pins to provide extra stability. The pins were inserted once the caulk had dried. Allow a day to be sure. 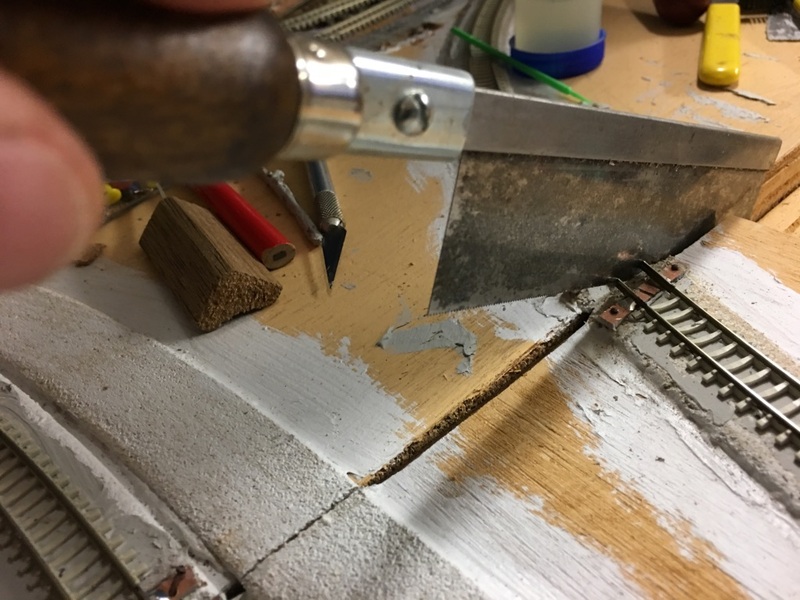 Also use a fine drill (smaller diameter than the pins) to drill through the holes in the copper ties to, and slightly into the plywood so the pins go in straight and do not split the plywood. 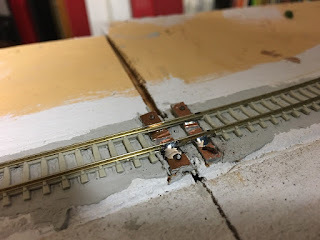 After all is dry and stable solder the rail to the copper ties. 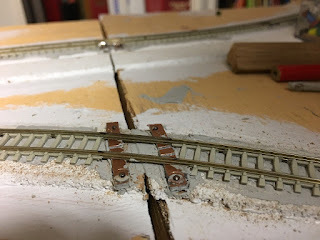 The soldering job looks "ugly" now as I used excessive solder but once the track is ballasted and weathered you will barely notice it. Next comes the scary part. How to cut the rails so the bridge can open? My research said to use a new sharp fine tooth razor saw. You could use a Dremel but it is difficult to get a vertical cut and the Dremel blades are slightly wider than a razor saw. The razor saw cuts easily. Use the gap in the bridge as a guide. 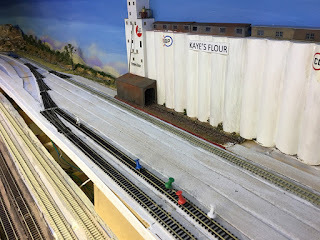 Slip through the cork roadbed and cut the rail as shown with light but smooth fast strokes. I could have used a track gauge to hold the rails but the caulk and soldering seemed to hold them firmly. Use a new, sharp saw and it cuts like "butter". Now the test, and this box car rolled through the gap without a hitch. Now to raise the bridge and lower it etc to test. So far so good. OK that is all. My plans are to decide on the type of signalling I will have on the new mainline. Do I block wire? Do I use infra red sensors? Do I have block occupancy? Do I link switch positions to the signals? So far the choices are wait for the new Atlas Signal Control Boards being released next month as I have several Atlas signals. I am also researching the new NCE signal boards, Azatrax, Logic Rail Technologies and I am sure there are other methods and solutions that balance ease of use with appearance / animation. I appreciate any input and suggestions.